In the Middle East, script developed from ideographs (characters representing concepts) to syllabic script (characters representing sounds). The oldest texts were either written on stone or on clay tablets, some of which have survived. In Oxford, we don’t have far to go to see examples: the Ashmolean Museum holds clay tablets as well as engraved stones. The stone monument pictured below is engraved with Hieroglyphic Luwian, where some symbols represent a whole word but most represent syllables. Syllabic scripts were regarded as systems of sounds that could be listed in syllabaries; lists of symbols that represent syllables with a consonant and a vowel in one symbol or element. 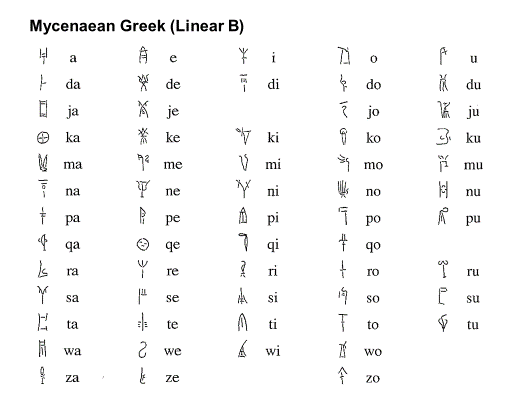 There are examples of such syllabaries in various languages, including the Native American language Cherokee, Japanese, Amharic (Ethiopic) and the Linear B writing system used to write Mycenean Greek. Since the symbols consist of just one element representing sounds like ‘da’ or ‘ja’, these symbols show no understanding of the distinction between consonants and vowels. Bilingual texts can help us to decipher scripts and translate unknown languages. 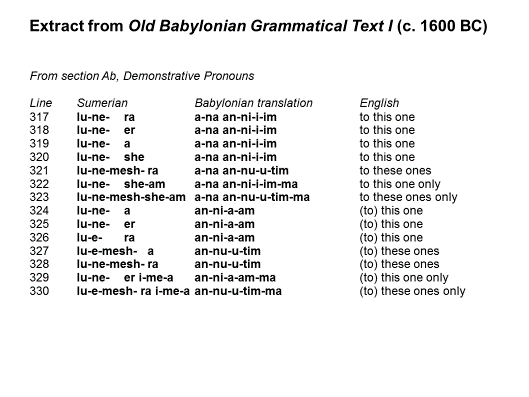 For example, the extract below from an Old Babylonian grammar with Sumerian translation gives us an insight into both languages. We can see in the chart below that Sumerian has more inflections than Babylonian. Members of the Babylonian elite were keen to learn the Sumerian language as it was seen as more prestigious. 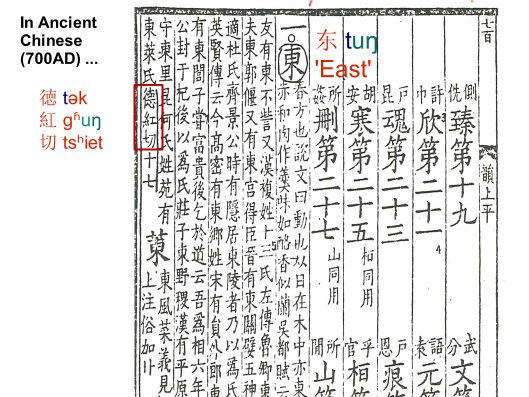 Ancient Chinese writing, which is entirely separate from the Middle Eastern tradition, also shows some awareness of sound structure. The majority of Chinese characters are picto-phonetic, so every character has a meaning in itself, but can also be used for its phonetic value as a sound. Even in the case of pictograms that do not have an internal structure, there are some examples indicating that scholars analysed the syllable in two parts as in the rhyme tables below. In conclusion, the earliest writing is based on both meaning and sounds, so even the oldest symbols could already represent sounds. “Sounds” usually means syllables or parts of syllables. Moving to writing based on sounds makes literacy easier to acquire and makes it possible to read and write almost anything, including intangible meanings and foreign names. Almost as soon as scribal education started, we have documents about language: sign-lists, lists of vocabulary, lists of translations, grammatical paradigms … in other words, what we once called Grammar and now call Linguistics. Many thanks to Prof. Coleman for the content of this blog. You can listen to the full lecture and see the slides here. Senner, W. M. ed. 1991. The Origins of Writing. University of Nebraska Press. Naveh, Joseph. 1982. 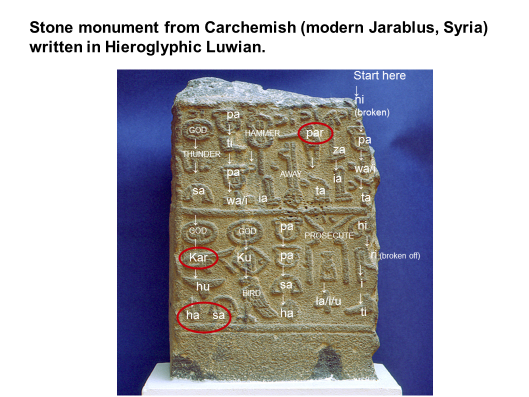 Early history of the alphabet : an introduction to West Semitic epigraphy and palaeography. Jerusalem : Magnes Press, Hebrew University ; Leiden : E.J. Brill. Powell, Barry B. 2012. Writing : theory and history of the technology of civilization. Chichester : Wiley-Blackwell. Jean, Georges. 1992. Writing : the story of alphabets and scripts. London : Thames & Hudson. Harris, Roy. 1986. The origin of writing. La Salle, Ill : Open Court. Daniels, Peter T. and William Bright, eds. 1996. The World’s Writing Systems. OUP. Coulmas, Florian. 1989. The Writing Systems of the World. Blackwell. Sampson, Geoffrey.1985. Writing Systems, a Linguistic Introduction. London: Hutchinson. Cohen, Marcel. 1958. La grande invention de l’écriture et son evolution. Paris : Impr. Nationale. Baines, John. J.Bennet and S.D.Houston. 2008. The disappearance of writing systems : perspectives on literacy and communication. London : Equinox. Asher, R. E. and E. J. A. Henderson, eds. 1981. Towards a History of Phonetics. Edinburgh University Press. Jacobsen, T. ‘Very Ancient Linguistics’, in: Hymes, D.ed., Studies in the History of Linguistics: Traditions and Paradigms. Indiana University Press. pp.41-62. Veldhuis, Niek. 2014. History of the Cuneiform Lexical Tradition. Münster : Ugarit-Verlag. Glassner, Jean-Jacques. 2003. The Invention of Cuneiform. Johns Hopkins University Press. Melchert, H. Craig, ed. 2003. The Luwians. Brill. Tsien, Tsuen-hsuin. 2013. Written on bamboo and silk : the beginnings of Chinese books and inscriptions. Chicago ; London : University of Chicago Press. Drucker, Johanna. 1995. The alphabetic labyrinth : the letters in history and imagination. London : Thames & Hudson. This entry was posted in Languages and tagged ancient scripts, linguistics, writing systems on 4 December 2017 by ferrarij.